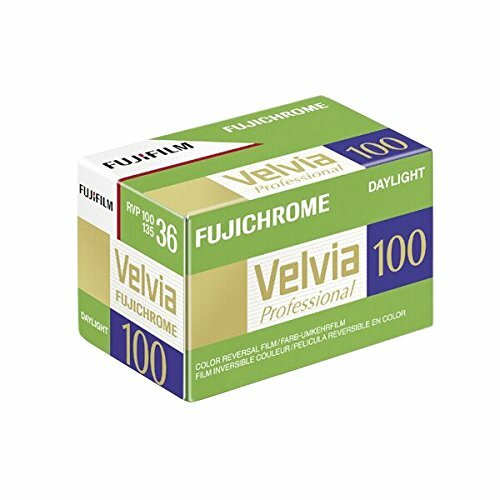 - Professional-quality, medium-speed, daylight-type, color reversal film with ultrafine grain (RMS : 8) and ultrahigh color saturation through the incorporation of new-generation cyan, magenta and yellow couplers. - Suited especially to scenery and nature photography as well as other subjects that require precisely modulated vibrant color reproduction and high image quality. - Provides color image stability equal to that of RVP 100F and can be push-processed up to +1 stop with excellent results and little photographic variation. Easy-to-use ISO 100 rating with the worlds highest level of color saturation. Attainment of the worlds highest color saturation level equal to that of Velvia (ISO 50) through the incorporation of new cyan, magenta and yellow couplers. RMS granularity of 8, one of the finest levels. Color image storage permanence (anti-fading characteristics) equal to that of RVP 100F as a result of new couplers. Minimum variation in color and gradation during push/pull processing over a range from -1/2 to +1 stop, providing an expanded range of phototaking opportunities, as well as facilitating fine adjustments in exposure and density during processing and allowing an increase in speed of up to +2 stops (equal to E.I.400), depending on the scene. RMS stands for Root Mean Square, a widely used standard method for measuring the degree of grain in photographic film. The lower the RMS number, the smaller the apparent grain.